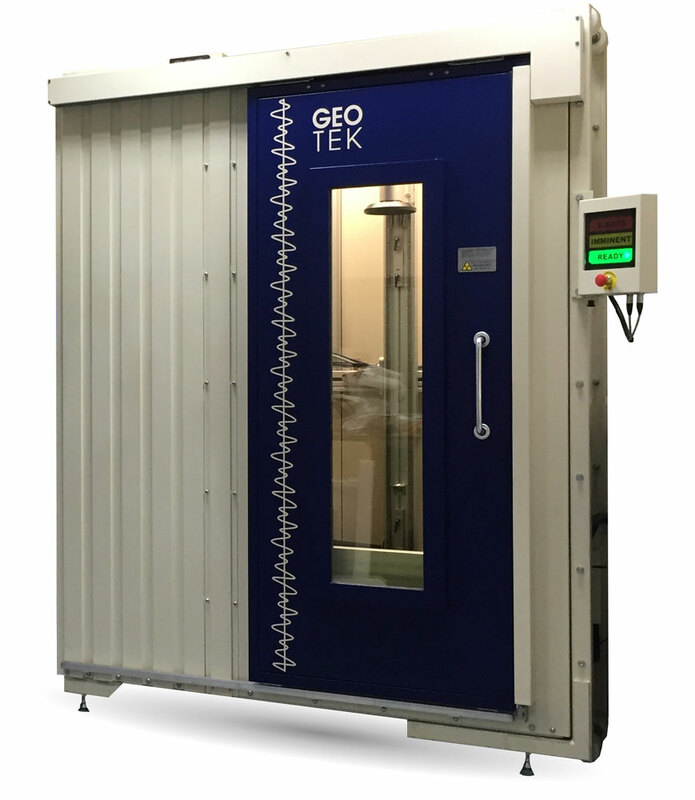 Vertical X-ray CT System (VXCT) – Geotek Ltd. 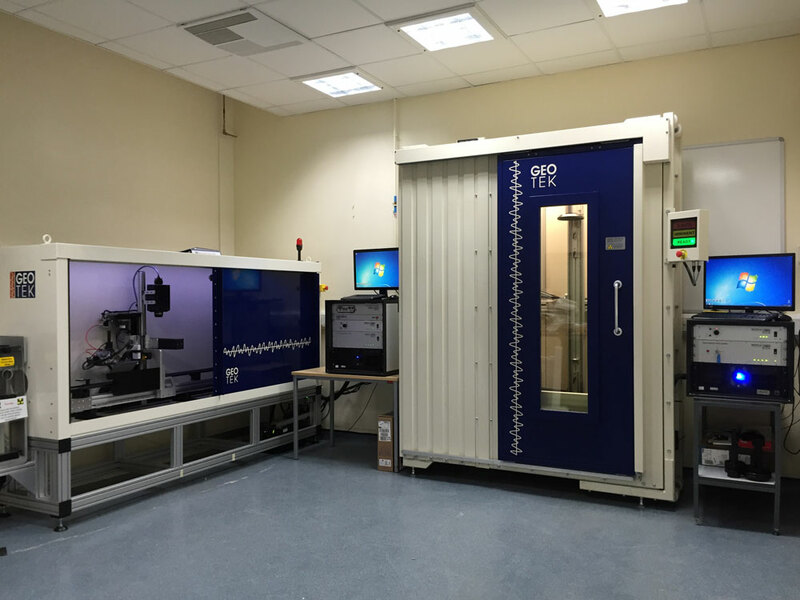 The Geotek VXCT system acquires both 2D X-ray transmission images and 3D X-ray CT volumes from lined whole core and, where stable, split core sections. Automated rotation of lined core sections allows users to visualise and record three-dimensional structures within the cores. These rotational images are used for computed tomographic (CT) reconstructions. X-ray CT imaging provides valuable quantitative data as well as information about core quality for sub-sampling or further analyses. The X-ray source and detector positions are adjustable and can be optimised for image quality, resolution and core size. Whole cores are centralised by special core cones that securely hold core samples vertically within the system. This innovative method allows for quick and efficient core loading. Core sections up to 155 cm in length and 15 cm in diameter can be inserted into the Geotek VXCT system. X-ray CT without a shielded room! The system is fully shielded and enclosed, compliant with USA & EU regulations, allowing it to be used in any normal laboratory environment. Warning lights indicate when the system is energised, and safety interlocks ensure that the X-ray source cannot be energised whenever doors are opened. Once the core is loaded, scanning of the core (both linear and rotational scans) is fully automatic. The user simply enters all the image views required into a queue. Alternatively, the user may manipulate the core under the X-ray beam, using linear and rotational controls, while examining images on a real-time display before deciding which images to acquire. There are many image analysis and core volume studies that will require a full 3D volume. The XCT is capable of acquiring 3D X-ray CT volumes at the resolution ranges mentioned in the table above. As part of the CT package Geotek provides software to reconstruct and view the core slices, generate orthogonal and circumferential images, and generate movies that fly through the core. The CT data from the Geotek system are exported as stacked 16-bit tiff files that can be loaded into the majority of CT viewing and image analysis packages. Geotek has developed a new image analysis feature called laminography. Laminography reconstructs 2D scans to extract a sequence of ‘slabs’ at increasing depths cross-core (with the depth direction being along the source-to-detector axis) . This is akin to optical imaging where features within each slab are brought into focus, with other features being blurred out as you move through the ‘slabs’. Each slab will be associated with a depth and therefore it will be possible to ascertain the depth and size of gravels, IRDs or shells within the core. See our Geoscience Research page for more information.